Valentines Day… whilst romance is great and something to be celebrated, we know this occasion can sometimes be a real strain on your bank balance. Nowadays it’s common for people to escape the UK for some winter sun and celebrate in style. However, we at Get Going, see no reason why you can’t have a romantic staycation on a budget, that’ll also leave your other half lost for words. Picture this; an idyllic country setting, wild horses, open moors, woodlands and quaint tea rooms. A place where donkeys, deer and cattle wander freely…oh and did we mention, it’s only 90 minutes from London (by train)? 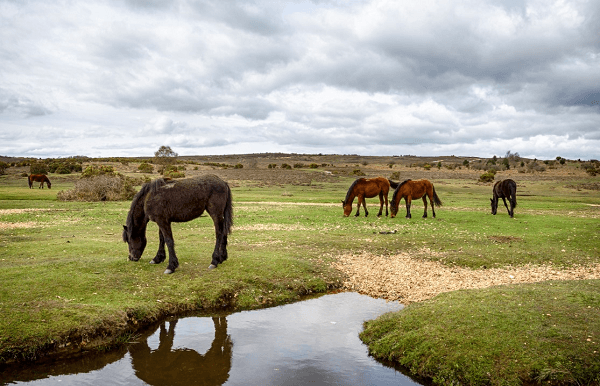 The New Forest is everything you want it to be, its picturesque and charming appeal makes it the perfect romantic spot in the UK…no matter the budget. The national park has to be one of the gems of The New Forest. Its history, wildlife and landscapes will amaze you, from deer to wading birds, you can’t help but see nature around every corner you turn. This is the perfect place for a romantic stroll (or cycle) and its free! You can never go wrong with a candlelight dinner… dimmed lights, music, delicious food, and a cheeky glass of bubbles. The New Forest has a number of restaurants and bars, perfect for the occasion. Keep your eye out for special menus and offers available, if you want to eat like kings and queens on a budget! If you fancy staying away for the night there’s a number of hotels, b&bs and even cottages hidden away down country lanes, away from everything and everyone (from as little as £69). This gives you the perfect opportunity to spend some much-needed quality time just the two of you! After just one visit you’ll be head over heels in love with Cornwall. It’s a destination that never fails to make you feel like you’re aboard when in reality you’re tucked away in the far west of Britain. It’s surrounded by the Atlantic Ocean, with the coastline stretching to almost 300 miles. Cornwall oozes romance, from long strolls through its diverse landscapes to its coastline maritime legacy, where you can buy fresh fish from local fisherman and prepare a delicious dinner for your loved one in a cosy log cabin (from as little as £13 a night). Cornwall has a number of attractions including The Eden Project, an educational charity which highlights the connection between us and the living world. It’s a fascinating place, and with all the gorgeous flower arrangements, walking through its tranquil gardens is a vision of beauty. Sounds romantic right-it must something in the air. There are a number of stunning beaches dotted throughout Cornwall. 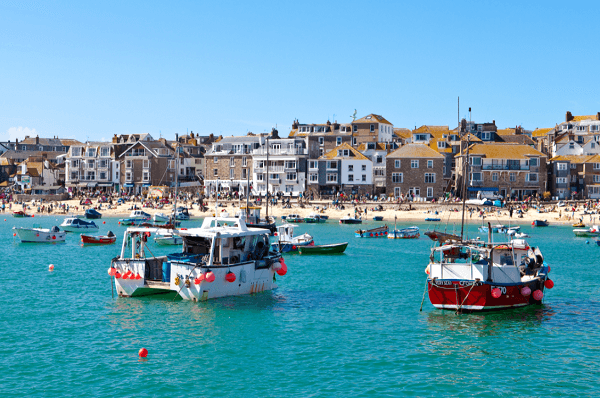 We suggest St. Ives, a picturesque seaside town named as one of TripAdvisor’s top 10 European beaches. Walk along the cobbled streets, exploring the quaint shops, before popping into a tea room for a traditional afternoon tea…we’re talking scones, jam, butter, clotted cream, (the proper stuff) the lot. What could be better? Cornwall is a host for delicious foods, from on the go snacks like the beloved Cornish pasty (which’ll set you back just £3), to the finest seafood restaurants serving the catch of the day. If you fancy a walk along the beach why not keep warm in thick coats, hats, scarves, gloves…maybe even whip out those trusty ear muffs and enjoy some fish and chips. Or if you’d prefer a night in this Valentines, exhausted from the sea air, why not stay in a self- catered cottage, light some candles, stick on some timeless love songs, and cook up a storm in the kitchen! 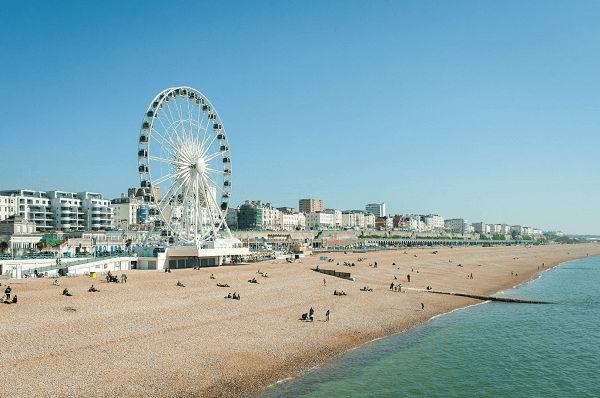 Brighton is a social hub, filled with bright colours, historic lanes (shopping paradise) and a gorgeous pebbled beach with vibrant beach huts dotted along the coastline. From exceptional food (literally every cuisine you could imagine) to affordable hotels, Brighton has it all! Only an hour on the train from London Victoria, you could stay just for Valentine’s Day or make a whole weekend of it. We recommend using public transport when visiting Brighton as parking is extremely expensive (and overpriced in our opinion). Brighton has so many attractions, with the pier being a focal point of the city. It’s a place where you and your partner can release your inner child, spend all your money on tokens, go on old school fairground rides, and share a dozen warm freshly cooked doughnuts. We don’t know about you, but that sounds like the perfect way to spend Valentines. Brighton is the LGBTQ capital of the UK, a title residents are extremely proud of. February is, in fact, LGBT history month with 2019’s theme being Peace, Activism and Reconciliation. Given that the community is so large, Brighton is not in short supply of LGBTQ bars, clubs and social events. So why not come down to this vibrant seaside town whether you’re celebrating Valentines with your loved one or if you just want to dance the night away with your friends! At the end of the day, you cannot put a price on love, however a surprise on Valentine’s day always goes down well with the other half. If you don’t want to spend a lot but you fancy a day or two away then a staycation is the perfect solution! Whatever you decide to do this Valentine’s Day, make sure you have the appropriate travel insurance. Just because you’re staying within the UK doesn’t mean you don’t need cover. Our single trip policies are available for staycations with a duration of 3 days (two nights) minimum. Information and prices correct as at January 2019.